For the 1970s World Football League team called the "Houston Texans", see Shreveport Steamer. In 1997, Houston entrepreneur Bob McNair had a failed bid to bring a National Hockey League (NHL) expansion team to the city, and Bud Adams relocated the city's NFL team, the Houston Oilers, to Nashville where they were renamed the Tennessee Titans. In 1996, a year earlier, the Cleveland Browns had controversially relocated to become the Baltimore Ravens. As part of the settlement between the NFL, the city of Cleveland, Ohio, and the team owned by Art Modell, the league promised to return football to Cleveland within the following three years. In order to even out the franchises at 32, the league also contemplated adding another expansion franchise. As Houston was one of the favorites for the extra franchise along with Toronto and Los Angeles (which had lost the Rams and the Raiders in 1995), McNair then decided to join the football project and founded Houston NFL Holdings with partner Steve Patterson. In association with Houston Livestock Show and Rodeo, they would push for a domed stadium as part of the bid to lure the NFL back to Houston. On October 6, 1999 the NFL awarded the 32nd team to Houston, at the cost of $700 million. The Houston Texans joined the league at the 2002 NFL season, playing at the newly founded Reliant Stadium. With their opening game victory over the Dallas Cowboys that season, the team became the first expansion team to win its opening game since the Minnesota Vikings beat the Chicago Bears in 1961. While the team struggled in early seasons, results began to improve once native Houstonian Gary Kubiak became the head coach in 2006. The Texans finished with a .500 season (8–8) in both 2007 and 2008, and nearly qualified for the 2009–10 NFL playoffs with a 9–7 result in 2009. In 2010, the team started the season on a 4–2 record going into a Week 7 bye week, but promptly collapsed 2–8 in the second part of the season, finishing 6–10. In the 2011 NFL Draft, the Texans acquired Wisconsin star defensive end J.J. Watt eleventh overall. The following season, former Cowboys head coach Wade Phillips was hired as the defensive coordinator of the Texans, and the improved defense led to the Texans finishing 10–6, winning their first AFC South title. The Texans then beat wild card Cincinnati Bengals 31–10 in the first round of the 2011–12 NFL playoffs, before a 20–13 defeat by the Ravens in the Divisional Round. The Texans surged as the team to beat in the AFC South in 2012, starting 5–0 and holding an 11–1 record by week 14. However, they lost three of their last four games to finish 12–4; beating the rival Indianapolis Colts in that four-game stretch allowing them to clinch their 2nd AFC South title. The Texans beat the Bengals again in the wild-card round, but they lost in the Divisional Round to the New England Patriots. In the 2013 NFL Draft, the Texans acquired Clemson wide receiver DeAndre Hopkins twenty seventh overall. In 2013, the Texans started 2–0 but went into a tailspin and lost every game afterwards. Kubiak was fired as head coach after being swept by the rival Jacksonville Jaguars, who themselves started 0–8. Wade Phillips filled in as head coach, but the Texans' poor form did not change, and they finished 2–14, tying, with 2005, their worst record in franchise history. The 14-game losing streak is also the worst in franchise history. The Texans entered the 2014 season with a 14-game losing streak. Former Penn State head coach Bill O'Brien became the Texans' new head coach, and the third in franchise history, during the offseason. In 2014, the Texans won three of their first four games, defeating the Redskins in the season opener, the Raiders, and the Bills, losing to the New York Giants. They lost three of their next four games, losing to the Dallas Cowboys, the Indianapolis Colts, and the Pittsburgh Steelers, respectively. The Texans went on to finish 9–7 in the 2014 season and barely missed the playoffs. In the 2015 season, they were featured on HBO, on the show "Hard Knocks". That year, the Texans started with a 2–5 record. Quarterback Ryan Mallett was released amidst controversy regarding his benching in favor of Brian Hoyer during a loss against the Indianapolis Colts. After a poor start, the Texans finished with a 9–7 record and won their third AFC South title. However, they were shut out by the Kansas City Chiefs in the Wild Card round 30–0, ending their championship hopes for the year. On March 9, 2016, the Texans signed former Denver Broncos quarterback Brock Osweiler to a 4-year, $72 million deal. Despite Osweiler's lucrative deal, he struggled significantly during the entire season. After throwing two interceptions in Week 15 against the Jaguars, coach Bill O'Brien benched the offseason acquisition in favor of backup quarterback Tom Savage. Savage led a comeback effort against the Jaguars, and was named the starter for the remainder of the season. The Texans clinched their fourth AFC South division title in six years in Savage's first career start against the Bengals in Week 16. They defeated the wildcard Oakland Raiders 27–14 in the opening round of the playoffs with Osweiler as the starting quarterback due to Savage being out with a concussion. Osweiler started in the Divisional Playoffs game against the New England Patriots, throwing three interceptions in the second half. The Texans lost 34–16. In the 2017 NFL Draft, the Texans traded up to the 12th overall selection to select Clemson star quarterback Deshaun Watson. Watson started six games his rookie year, going 3–3 and having arguably the greatest and most decorated rookie season by a quarterback in NFL history, eventually rising up to become the Texans' franchise quarterback. However, his success would come up very short, following a Week 8 41–38 loss to the Seattle Seahawks, Watson tore his ACL in practice and was ruled out the remainder of the season, which caused the Texans to have one of their worst seasons. Plagued by a series of unexpected injuries (including a second consecutive season-ending injury to J.J. Watt) and controversy involving the team's suspected violation of the league's concussion protocol, after backup quarterback Tom Savage suffered a seizure following a Week 14 game against the San Francisco 49ers, the Texans went 1–9 the rest of the season and eventually finish 4–12 and last in the AFC South in 2017, missing the playoffs for the first time since 2014 and giving Bill O'Brien his first losing season as Texans head coach. In 2018, the Texans started the season 0–3, losing by a combined 15 points to the New England Patriots, Tennessee Titans, and New York Giants, before winning a 37–34 overtime shootout on the road in Indianapolis. This win sparked an nine-game winning streak for the Texans, their first since starting 5–0 in 2012, which included a Week 8 win against the Miami Dolphins that included five touchdown passes from Deshaun Watson. This streak was the longest ever for a team that started the season 0–3; the previous record was an seven game win-streak set by the New York Giants in 1918 after starting out 0–3. On November 23, 2018, the owner of the Houston Texans, Bob McNair, died from skin cancer. On November 26, 2018, McNair's wife, Janice McNair, became the principal owner of the Houston Texans, while their son, D. Cal McNair, became the Chairman and Chief Operating Officer. The Texans finished the season 11–5, and won another AFC South division championship under Bill O'Brien. They then lost 21–7 in the first round of the playoffs to their AFC South division rival Indianapolis Colts. On March 2, 2000, Houston NFL 2002 announced that the team name search had been narrowed down to five choices: Apollos, Bobcats, Stallions, Texans, and Wildcatters. The list of names was determined after several months of research conducted jointly by Houston NFL 2002 and NFL Properties. An online survey regarding the name generated more than 65,000 responses in just seven days. On September 6, 2000, the NFL's 32nd franchise was officially christened the Houston Texans before thousands at a downtown rally in Houston. McNair explained that the name and logo "embody the pride, strength, independence and achievement that make the people of Houston and our area special." The nickname "Texans" was more recently used by the now-defunct Canadian Football League franchise in San Antonio; the Texans had previously been the name of a former World Football League franchise in Houston, which moved to Louisiana to become the Shreveport Steamer; the Dallas Texans of the NFL which only played in the 1952 season; and the nickname was also used by the precursor of the present-day Kansas City Chiefs, when they were the Dallas Texans of the American Football League (AFL). Owner Bob McNair received permission from Chiefs' owner Lamar Hunt to use the Texans nickname for his new team. Along with the team name, McNair also unveiled the team logo, an abstract depiction of a bull's head, split in such a way to resemble the flag of Texas and the state of Texas, including a lone star to stand for the eye, the five points of which representing pride, courage, strength, tradition and independence. McNair described the colors as "Deep Steel Blue", "Battle Red" and "Liberty White". A year later the Texans unveiled their uniforms during another downtown rally. The Texans' helmet is dark blue with the Texans bull logo. The helmet was initially white when the team name and logo were unveiled, but was later changed to dark blue. The uniform design consists of red trim and either dark blue or white jerseys. The team typically wears white pants with its blue jerseys and blue pants with its white jerseys. Starting with the 2006 season, the Texans wore all-white for their home opener, and the team began to wear an all-blue combination for home games vs. the Indianapolis Colts. In 2003, the Texans introduced an alternative red jersey with blue trim; they wear this jersey at one home game each year, usually against a division rival. In 2007, the Texans introduced red pants for the first time, pairing them with the red jerseys for an all-red look. (This uniform combination was not well-received and has since been retired). In October 2008 the Texans paired blue socks (instead of the traditional red) with their blue pants and white jerseys. In 2016, the Texans unveiled a new uniform combo against the Jacksonville Jaguars, pairing the red jersey with blue pants and red socks. In 2017, the Texans wear the color rush uniform with all-navy blue. In 2002, the team wore a patch commemorating their inaugural season. Also, they celebrated 10 years as a franchise by wearing an anniversary patch throughout 2012. The Texans are the youngest franchise in the NFL, having only been competing in the NFL since 2002. For that reason, they have not had the history or the reputation on which to build classic rivalries like the ones that often exist between older franchises. The Tennessee Titans, who were formerly the Houston Oilers before their relocation in the 1990s, are viewed by many Houston fans as the Texans' chief rival and happen to be a team in the AFC South. The Texans also have an AFC South Division rivalry with the Indianapolis Colts, whom the Texans had never defeated in Indianapolis until the 2015 season. More recently, Houston has increased bitterness with the Indianapolis Colts due to their young Houston-native quarterback Andrew Luck having been drafted by the Colts in 2012 and the franchise's first ever sweep of the Colts against Luck in 2016. In 2018 the two teams met in the AFC Wild Card Playoffs, with the Colts winning 21–7. 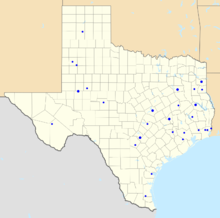 The Texans also have an intrastate/interconference rivalry with the Dallas Cowboys, with whom they contest the so-called Governor's Cup every year (a tradition started between the cities prior to the Oilers relocating) either in the preseason or the regular season for bragging rights in the state of Texas. In 2017, the destruction and flooding caused during Hurricane Harvey a few days before their Week 4 pre-season match up time scheduled caused the game to be relocated to AT&T Stadium in Arlington, Texas. However, out of concern for the safety of the fans and the condition of the player's families & communities, the game was cancelled. The Texans also have an AFC South Division rivalry with the Jacksonville Jaguars. As of the end of the 2018 season, the Texans' overall regular season win-loss record is 121–151. The Texans notched the 100th regular season win in their history when they defeated the Tennessee Titans on October 2, 2016. The Texans posted their best-ever season record in 2012, finishing at 12–4. The team's worst-ever seasons on record are 2–14, in both 2005 and 2013. Most recently the Texans finished 11–5 in 2018, winning their fifth AFC South championship. The Texans are 3–5 all-time in playoff games. All five of the Texans' playoff berths were as a result of winning the AFC South division championship. The Texans have a 3–2 record all-time in Wild Card Round games but have lost all three games they have played in the Divisional Round. As members of the AFC South, the Texans play 6 of their 16 regular season games against other AFC South teams. As of the end of the 2018 season, the Texans have a cumulative regular season record of 45–57 against their three divisional rivals: 21–13 versus the Jacksonville Jaguars; 16–18 versus the Tennessee Titans; and 8–26 versus the Indianapolis Colts. The Texans have fared slightly better against the rest of the AFC, posting a regular season record of 48–54 against AFC teams from divisions other than the South, with a 17–18 record against AFC East teams, 17–18 against AFC North teams, and 14–18 against AFC West teams. The Texans are 28–40 against NFC teams, tallying a 6–14 record against NFC East teams, 8–8 against NFC North teams, 9–7 against NFC South teams, and 5–11 against NFC West teams. As of the end of the 2018 season, there is one team against which the Texans have never lost: the Chicago Bears (4–0). There are also two teams which the Texans have never beaten: the Minnesota Vikings (0–4) and Philadelphia Eagles (0–5). According to the NFL's scheduling formula, the Texans' next regular-season game against the Eagles will be in 2022, and their next regular season games against the Bears and Vikings will occur in 2020. On November 19, 2017, Andre Johnson was the first-ever inductee into the Texans Ring of Honor. Player Introduction – When the players are introduced before the game, the announcer says the player's first name and the crowd yells out the last name (e.g. The announcer will say "Defensive End J.J...." and the crowd will yell out "WATT!!!"). As of 2007[update], the Texans' flagship radio stations were KILT SportsRadio 610AM and KILT 100.3FM. The AM station has an all-sports format, while the FM station plays contemporary country music. Both are owned by Entercom. Marc Vandermeer is the play-by-play announcer. Heisman Trophy winner Andre Ware provides color commentary, and SportsRadio 610 host Rich Lord serves as the sideline reporter. Preseason games are telecast by KTRK, an ABC owned and operated station. Kevin Kugler calls the preseason games on TV, with former Oilers running back Spencer Tillman providing color commentary. Regular season games are aired over CBS affiliate KHOU, FOX affiliate KRIV if the Texans host an NFC team, and NBC affiliate KPRC for Sunday night games. Spanish-language radio broadcasts of the team's games are aired on KGOL ESPN Deportes 1180AM. Enrique Vásquez is the play-by-play announcer. José Jojo Padrón provides color commentary, and Fernando Hernández serves as sideline reporter. Until 2017, the theme song of the Texans was "It's Football Time In Houston" by Clay Walker, played after every Texans touchdown. The song was donated by Walker to the city of Houston. The Texans tried to introduce a new fight song in 2003, but quickly returned to the original after a negative reception by fans. As of 2017, the touchdown theme song is "God Blessed Texas" by Little Texas. The Texans' defensive squad takes the field to the sound of "Bulls on Parade" by Rage Against the Machine. The Texans started using the song after former linebacker Connor Barwin coined the nickname in a tweet in 2011. Community outreach by the Houston Texans is primarily operated by the Houston Texans Foundation, who works with multiple community partners. The Houston Texans organization is also a supporter of the character education program, Heart of a Champion. In 2017, the 15th annual Houston Texans Charity Golf Classic raised more than $380,000 for the Foundation. More than $27.2 million has been raised for the Foundation since its creation in 2002. Texans DE JJ Watt raised $41.6 million in relief funds for Hurricane Harvey after the storm devastated the city in 2017. ^ a b "Texans Team History". HoustonTexans.com. NFL Enterprises, LLC. Retrieved December 24, 2018. ^ "Houston Texans Team Capsule" (PDF). 2018 Official National Football League Record and Fact Book. NFL Enterprises, LLC. August 9, 2018. Retrieved November 21, 2018. ^ "Fingertip Information" (PDF). 2002 Houston Texans Media Guide. NFL Enterprises, LLC. 2002. Retrieved April 8, 2016. ^ "Texans Front Office". HoustonTexans.com. NFL Enterprises, LLC. Retrieved December 24, 2018. ^ McClain, John (August 19, 2016). "How the Oilers left Houston and set the stage for the Texans". Houston Chronicle. Retrieved September 2, 2016. ^ McClain, John (December 11, 2011). "AFC South champion Texans reach playoffs for first time in dramatic fashion". Houston Chronicle. Retrieved March 30, 2016. ^ "Team History". Pro Football Hall of fame. n.d. Retrieved August 13, 2017. ^ a b Powers, John (December 10, 2012). "Texans have climbed to the top of NFL". The Boston Globe. Retrieved September 2, 2016. ^ "Foster powers Texans to win over Bengals". Reuters Canada. January 7, 2012. Retrieved January 7, 2012. ^ "NFL Gamebook: HOU @ NE" (PDF). NFL. January 13, 2013. Retrieved January 13, 2013. ^ "Texans hire Bill O'Brien as head coach". Houston Texans. January 3, 2014. Retrieved September 2, 2016. ^ Mathews, Nick (January 3, 2014). "Bill O'Brien officially introduced as Texans new coach". Houston Chronicle. Retrieved September 2, 2016. ^ Chiari, Mike (October 27, 2015). "Ryan Mallett Released by Texans". Bleacher Report. Retrieved September 2, 2016. ^ Rosenthal, Gregg (March 9, 2016). "Brock Osweiler agrees in principle to $72M Texans deal". National Football League. Retrieved September 2, 2016. ^ Sidhu, Deepi (January 7, 2017). "Texans defeat Raiders in Wild Card game". NFL.com. Retrieved January 10, 2017. ^ "Patriots top Texans, move on to AFC Championship". NFL.com. Retrieved January 16, 2017. ^ "Franchise nicknames". Pro Football Hall of Fame. January 1, 2005. Retrieved September 2, 2016. ^ a b "McNair unveils name, logo for Houston". National Football League. September 6, 2000. Archived from the original on November 9, 2000. Retrieved September 2, 2016. ^ "TORO bio" (PDF). Houston Texans. Retrieved September 2, 2016. ^ "Texans Cheerleaders". HoustonTexans.com. Retrieved September 3, 2012. ^ Sidhu, Deepi (December 11, 2016). "Texans sweep Colts with 22-17 win". Houston Texans. Retrieved September 6, 2017. ^ Silver, Michael (January 5, 2019). "Frank Reich leads Colts to comprehensive beatdown of Texans". NFL.com. Retrieved January 7, 2019. ^ "Houston Texans Head-to-Head Records - Pro-Football-Reference.com". Pro-Football-Reference.com. ^ "Texans May Go Back to Clay Walker Song". Associated Press. August 14, 2003. Archived from the original on November 3, 2012. Retrieved March 1, 2010. ^ "20 Questions with Clay Walker (Part 2)". CMT. Retrieved March 2, 2010. ^ "Texans ditch fight song". ESPN.com. Retrieved February 24, 2019. ^ "Spring High School staff, students recognized for work on Texans fight song". Houston Chronicle. August 13, 2003. Retrieved February 24, 2019. ^ Balke, Jeff (December 5, 2011). "Bulls on Parade: Ten Songs for Ten Texans Players and One for the Team". Houston Press. Retrieved September 2, 2016. ^ Scurfield, Nick (December 4, 2011). "Bulls on Parade: A nickname is born". Houston Texans. Archived from the original on December 8, 2011. Retrieved September 2, 2016. ^ "HoustonTexans.com – Houston Texans Foundation". ^ "Our Partners". Heart of a Champion. Retrieved January 8, 2012. ^ "Houston Texans Charity Golf Classic a big hit!". Retrieved May 10, 2017. ^ "J.J. Watt: $41.6M in Hurricane Harvey relief shared". NFL.com. Retrieved January 5, 2019. Wikimedia Commons has media related to Houston Texans.